To create a new round, click the + icon on the Rounds tab. If only one golf course has been configured then this will be automatically selected as the venue for the round, otherwise the required golf course should be selected. The Start and Finish times will default to the current time and the current time plus 4 hours respectively. These may be amended as required by clicking the values. The scorecard includes a column that will show the suggested start or finish time for each hole which may be used to check that the round is being played at an appropriate speed. The Competition field is optional. 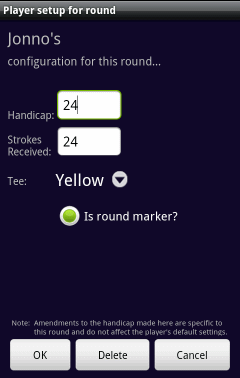 The Type dropdown determines the scoring system to be used on the scorecard. It also impacts the calculation of the Strokes Received (shown as SR'd) for each player. To add players to the round, click the + icon. Players will be added with their handicap/course-handicap set according to their handicap/handicap-index configured into their player profile. They will be assigned to the default tee colour for their gender as configured in Preferences (if this default has not been setup for the current golf course then an arbitrary tee will be selected). An initial value for a player's Strokes Received will be calculated according to their handicap, the type of scoring system selected and also the relative difficulty of the players tee (if more than one tee is being used). ((HandicapIndex * SlopeRating) / 113) rounded to the nearest whole number. To amend any of the values click the player name. Players may be removed from a round by long-clicking their name. When removed from a round, the player will also be removed from the associated scorecard. If any values have been amended then, if required, the 'SRd +/-' button may be clicked in order to recalculate the Strokes Received values. A Teams icon will be visible for rounds that have 3 or 4 players. To configure a team, click the icon, select the players that are to form one of the teams and click OK. The unselected players will become the other team. Red or white icons to the left of the player names will indicate how the teams have been set up. Players may be teamed up as 2 vs 2, 2 vs 1 or 3 vs 1. To clear the teams, click the Team icon and then click OK without selecting any players. To access the scorecard for the round, click the scorecard button. Once a round has been saved, the scorecard may also be accessed directly from the Rounds list screen by long-clicking the round date.